Another painted beach rock from Cape Ann MA. I love all your rocks. Such a wonderful thing to do. Love the Tagore's words and your beautiful stone. Lucky who will find it. Pretty painted rock, love the painted scene. Happy Friday, enjoy your day and weekend! That quote is a favorite of mine:) I love your rock paintings - you really add some lovely details to such a tiny piece. Happy PPF! A cool scene for the hot summertime. What a sweetly painted rock, how lucky is the person that will find it!! Happy PPF. 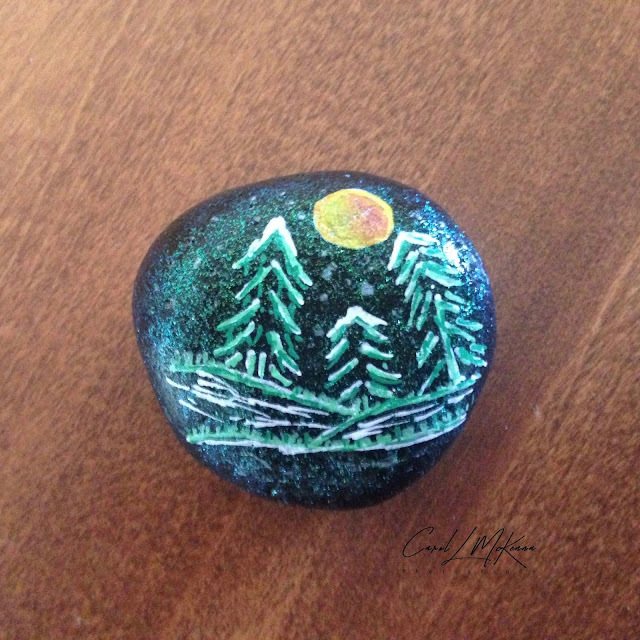 A very nice painted rock. Our town does this too. They are hidden everywhere. Most people don't take them, but leave them for the next person. I think this looks lovely, especially good idea with the fir trees. What a beautiful sharing this week. The quote and the rock offer such positive feeling. Thank you!